Invitation inspiration is what’s needed to get your party off to the right start. 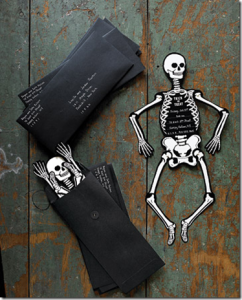 Fun invitations will help you and your guests get into the Halloween spirit and create a bit of intrigue about your upcoming bash. You can do it extravagantly, economically, or ecologically – theming it is the main goal. Why not send out invitations on glittering masquerade masks, cardboard coffins, gravestones or skulls? Receiving a rubbery, severed finger through the post should also get some attention! For glitzier Halloween parties, a few sequins, beads and a bit of glitter can make for some rather snazzy skulls. Those who want to be eco-friendly could send some personalized online invites instead. It’s all about social media these days, so jump on that bandwagon to make the best of your party. Twitter and Instagram are firm faves and you can utilise them by designating a simple hashtag for your event, such as #JonesHalloweenParty. You can broadcast it on chalkboard sign and on your social networks. Some pre-party photos can work well for promotion and intrigue! Instagram is all about cool photos, so enhance the creative creep-factor with a Halloween costume booth area. Decorate it with blood stained sheets (paint, of course! ), cobwebs, spiders, vampire faces etc. 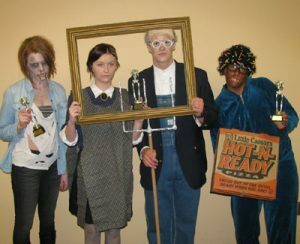 ; people will jump at the chance to grace your booth with their costumes and they’ll love flicking through the eyebrow-raising shenanigans, post-party. Before your party gets going, you can organise a trick or trick route through your neighbourhood for any children in attendance. Plan it out and let your neighbours know you’re coming, and make sure you start elsewhere and end the route at your house to start the party. 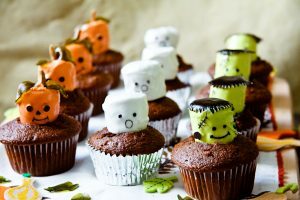 There are likely to be other Trick or Treaters in your neighbourhood, so as a measure against disrupting your party, you can leave your own treats outside the door for any passing kids. This is a necessity! Setting the scene right will go a long way toward making your party ultra-memorable. 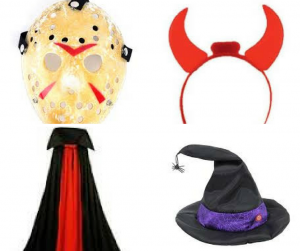 You’ve got so many themes to choose from: Zombie apocalypse, haunted house, graveyards, gothic mansion, voodoo masquerade… and there’s always the good old black and orange pumpkin, witch and spider theme. Decide on which rooms are going to be used and then go full throttle on your theme; don’t forget the outside areas – it can be a lot of fun to spook-up your patio, deck or garden and the dark night outside will make a perfect back drop. Bushes and trees will cling to cobwebs and hanging spiders, and a few broomsticks and evil pumpkins never hurt anybody… or did they? Drape a scream mask over a vertical broom-handle for a scarier-than-scary scarecrow, and add some red or blue garden lights for an eerie hue. Halloween means carved pumpkins, so grab a sharp knife and gauge out some ghastly grins! Internet templates and tutorials will make you a pumpkin carving pro in no time. With a light inside them, they look great in a line along your porch or walkway, and dotted around your back yard. 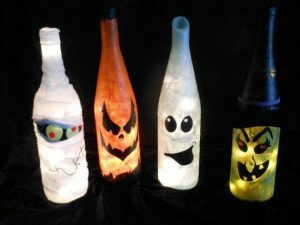 You can even spray them with metallic paint for a golden glow, or write and draw on them with chalkboard paint. Inside, lighting is equally important; candles and fairy lights work best, in red, green, blue, orange etc. Keep some rooms dark, and consider mood lights for an alternating vibe. Rubber critters like snakes, rats, and bugs can pop up in surprising places, like your fridge, medicine cabinets (someone is bound to look! ), cupboards etc. Stuff a few crawlies in the corners of sofas and around the shoe rack. A disembodied head in the fridge should get heartbeats hammering, as may the odd strategically-placed severed finger or hand. Fake blood sprayed up the glass shower screen or tub makes for a convincing murder scene, along with bloodied handprints on mirrors and ceramic surfaces; these are also great locations for pleading, bloody messages like “HELP ME”. If you want to push it, you could throw a few disembodied limbs and a chainsaw into the tub! Your guests may be reluctant to use the toilet, mind. 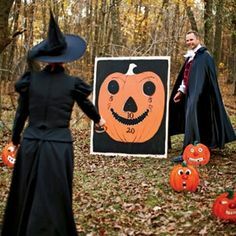 Ditch the family snaps in favour of lenticular or other creepy images, children’s handprints in black paint are always pretty creepy, and motion Sensor props are a fab way to get guests jumping out of their skins. 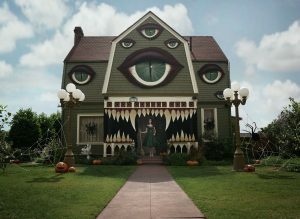 You’re your home into a house of horror with dropping spiders, screaming paintings, lunging rats or zombies. Nobody will forget this party in a hurry! 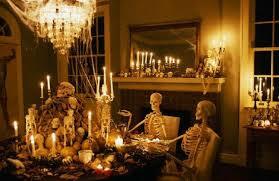 Ghoulish-gastronomy is the way forward for a Halloween bash to remember. 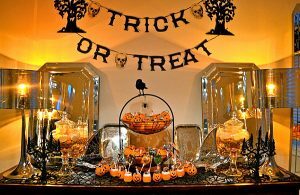 Jars filled with orange and black-wrapped sweets, chocolate, jellybeans, candy corn etc. Every Halloween party should boast a blood-red juice bobbing with eyeballs (sangria, red wine, cranberry juice or Ribena). A signature cocktail is also a great idea, the more bizarre the better! It is Halloween, after all. Simple cocktails of orange and blood colours will also suffice; think Screwdrivers and Bloody Marys. To add to the effect, pop a licorice stick in each, in place of stirrers. You could even hand them out in test tubes or blood vials! Pour cranberry juice or Ribena into ice cube trays to throw into a punch, or make up some bloody ice hands by pouring the same into disposable gloves and freezing them. Then present your punch in a witch’s cauldron. Glass bottles can be souped-up with horrible homemade labels; think poisons and elixirs, like rat poison, cyanide, witches brew, or truth serum. 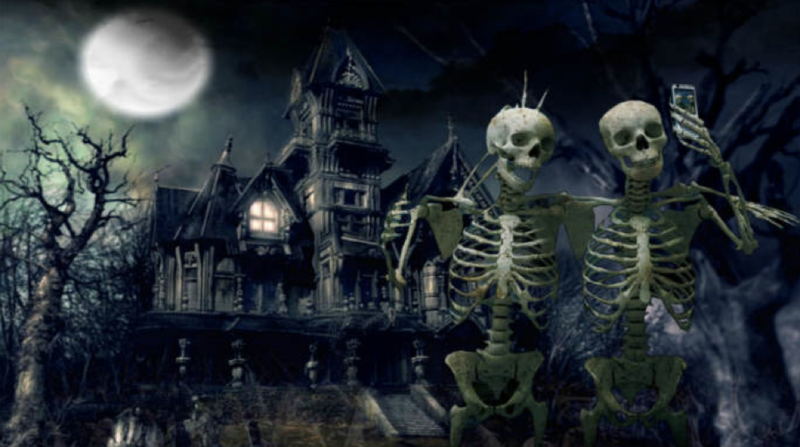 Keep the atmosphere spooky with a selection of themed songs such as popular hits like The Doors’ “People Are Strange”, Michael Jackson’s “Thriller,” Ghostbusters theme song, etc. As you probably won’t have enough to fill a whole evening without repetition, you could invest in a soundtrack of creepy sound effects. Keep guests on their toes with the sound of blood curdling screams, axes being landed, werewolves howling, animals growling, knives being sharpening, creepy laughter and children singing spooky rhymes. These won’t be too hard to come by on iTunes and Pandora; you should even find live-streaming Halloween compilations. 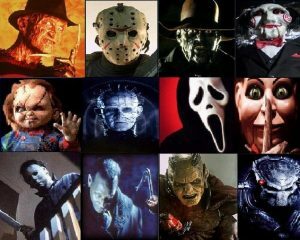 There’s nothing like a few haunting memories in the form of classic horror movies projected silently onto a wall of the house. If you can keep a white wall free for this, great – if not, it may be worth borrowing a projector screen for this. If that’s not an option, a widescreen TV on silent will do the trick. 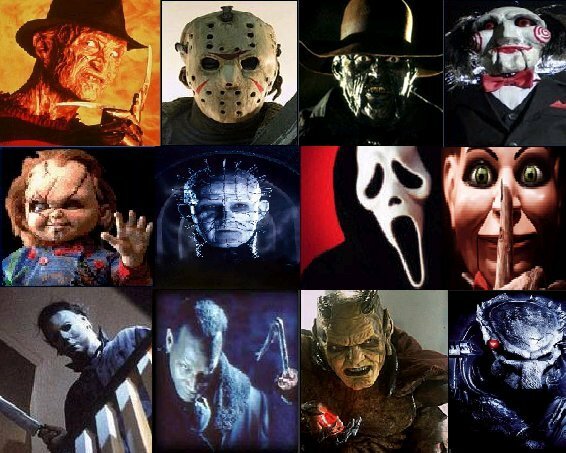 Some good choices would be Friday the 13th, The Exorcist, The Shining or the obvious: Halloween. If you want to tone the panic down a little, go for something like The Addams Family, Beetlejuice, Frankenstein or a feel-good Halloween flick such as It’s the Great Pumpkin, Charlie Brown. 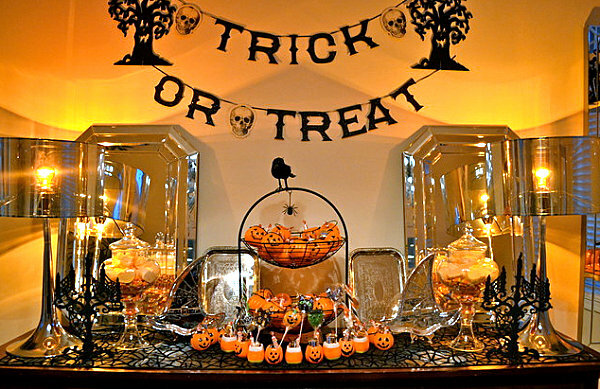 No Halloween party would be complete without a few goulish games to keep guests entertained. Hire a real one, or dress up as a terrifying tarot reader who tells tales of misfortune! Mummify yourselves in toilet paper; he or she who turns their teammate into the most convincing mummy wins. Another version would be winning by mummifying a teammate with the entire roll, first. A gruesome game such as Dead Man’s Guts will really turn a few stomachs! Play ‘Pass the Pumpkin’: Teams of two in rows pass a mini pumpkin around the room without using hands. The first to push their pumpkin over the line wins. You don’t need to be having a party to keep a stash of dress-up items! It can be fun for guests to change things around a bit on the night, morphing from vampire to ghost and back. 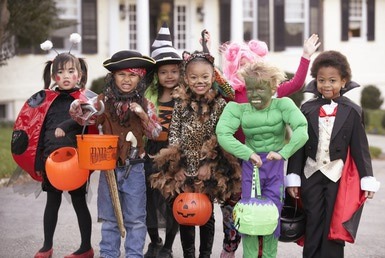 Those who weren’t happy with their costumes or were lacking in inspiration will thank you for it! Have a box ready with masks, wigs, fangs, hats, capes, a bloody apron and a few murder weapons. Pit your guests against each other to inspire the most creative costume ideas on the night. Choose appropriately themed prizes that they will covet; they need not be expensive – think red wines and juicy-looking cakes, for example. At some point in the night, have a catwalk-style parade in a designated room and ask all guests to throw their vote on a piece of paper into a witches hat. You might want to categorise for more than one prize, with options such as sexiest, scariest, most original, funniest; or just stick to a main prize for the best costume. This is a great way to end the night. Nobody will sleep, however! 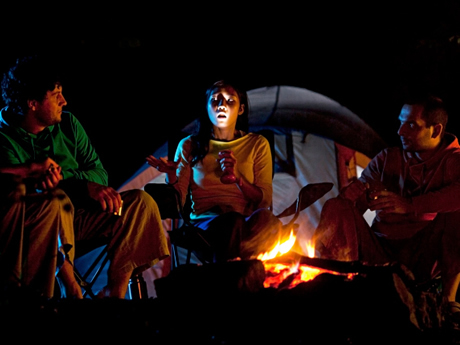 Ghost stories are great if you have an outdoor area with fire pit, or a creepy basement, loft space or attic. Get your guests to share their spookiest real-life tales. Following these ten steps should be enough to imprint your party firmly on the memories of all involved. Have fun setting up and we wish you a hell of Halloween!